A magical night unfolded in Memorial Chapel Jan. 16 as Disney songwriting legend Richard Sherman shared the stage with Disney Creative Director Marilyn Magness ’75 for a musical conversation touching on some of the highlights of Sherman’s extraordinary six-decade career. At the end of the evening, to honor Sherman’s influence, inspiration and creative genius, the University of Redlands conferred upon him the honorary degree of Doctor of Music. “We honor a man whose songs have reached beyond our minds and into our hearts—whose lyrics and melodies have not only touched and uplifted the soul and spirit of this generation, but will do so for generations to come,” the degree proclamation states. 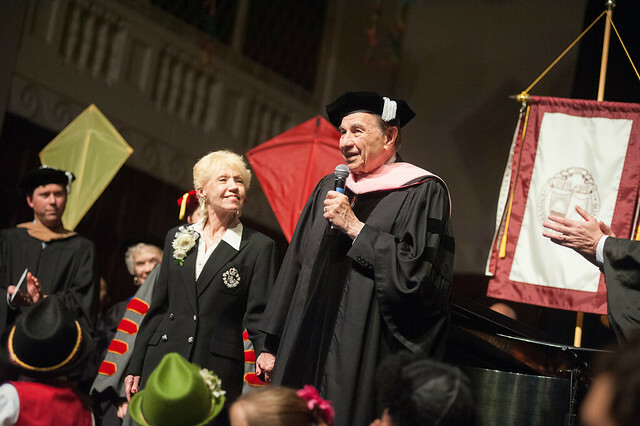 The degree was conferred by University President Ralph Kuncl, who welcomed Sherman as honorary alumnus of the University and offered a musical tribute on the piano of his own.